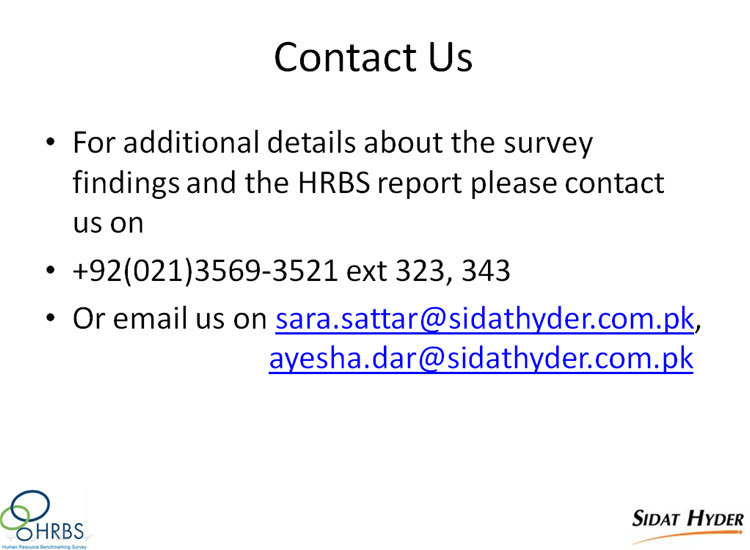 Sidat Hyder Morshed Associates regularly conducts its biennial Human Resources Benchmarking Survey which has been carried out every 2 years since 2006 and will be running for the 6th cycle this year. 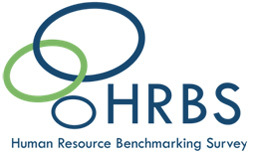 Over the years, about 100 organizations both local business groups and multinationals have participated in HRBS, representing a range of sectors i.e. Oil & gas, FMCG, IT & Telecom, Banking & FI, Pharmaceutical and Fertilizers, etc. 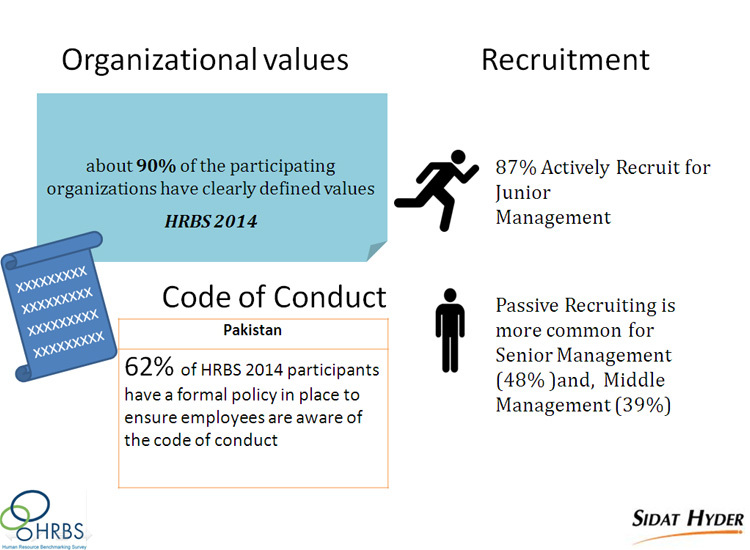 The HRBS survey features a broad based coverage of entities operating in Pakistan and the objective is to document the current HR Practices in the country and benchmark these against HR best practices, both locally as well as globally. 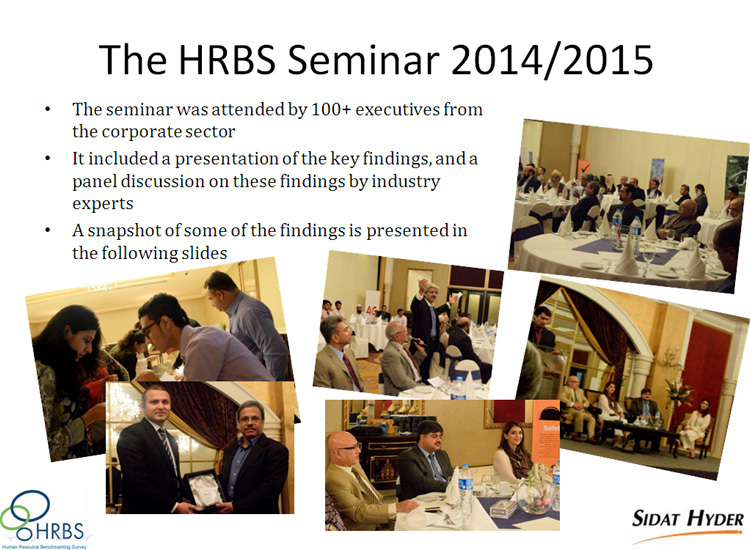 The HRBS 2012 revealed that overall, the HR function is becoming more sophisticated, formal and documented in Pakistan. Aspects relating to Organizational Culture have shown an overall improvement. All participating organizations in 2012 mentioned that they have a documented vision and mission statement, and most had developed these through consultation with relevant stakeholders. Almost all respondents also regularly update their HR policies and procedures, use employee handbooks, and conduct exit interviews. The trend for mobile working is on the rise, and half the respondents allow mobile working, most of them being from the services sector. In recruitment, unstructured and behavior based interviews are most preferred assessment tools, as are technical testing and psychometric testing. Generally, organizations carry out 2 to 3 interviews before selecting a suitable candidate. HR enjoys veto power in recruitment mostly for junior and middle management positions, but not for senior management. 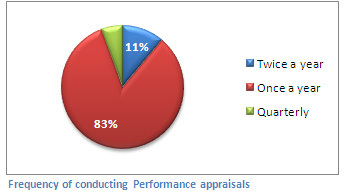 It was reported that, a Formal Grading Structure is present in most of the surveyed organizations (89%). 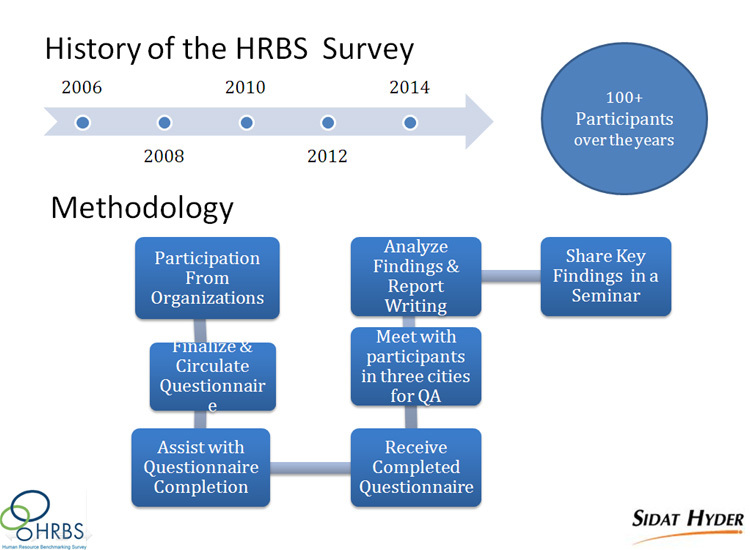 Most organizations take part in General Market compensation surveys, at least once a year. Performance appraisals are generally conducted once a year, with a single appraiser. Most organizations are using competencies, KPIs and interactive face to face discussions as the main features of their performance appraisal systems. About 28% organizations assign equal weight to goal setting and competency based skills in their appraisals. Majority of the organizations conduct trainings on performance management. The performance appraisal process takes on average, 2 to 3 months. 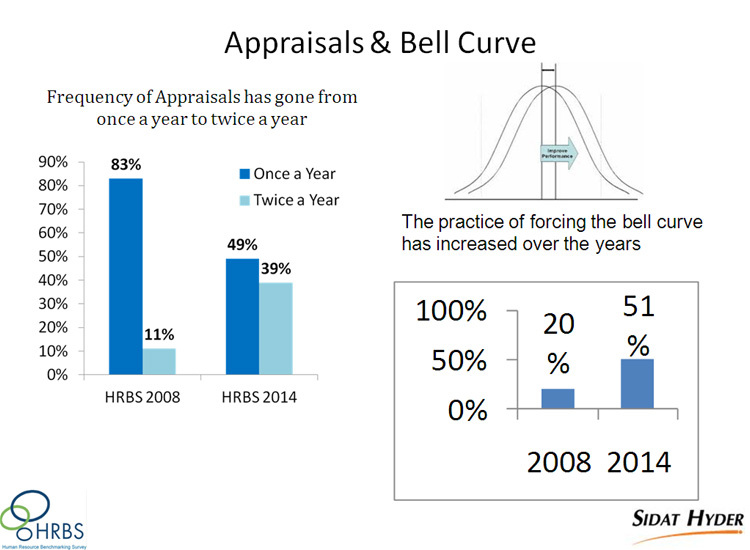 Almost half the organizations are using the forced bell curve, and 66% respondents use a 5 point scale for their appraisals. A Formal documented Career Plan is present in 50% of the organizations, and almost all of them are documenting career plans for the Senior and Middle management levels. It appears that formal Succession planning is common for senior and middle management levels but mostly in larger organizations. In the case of Training and Development, the use of TNA as a formal technique has been steadily increasing over the years, as it was prevalent in 75% of the organizations in 2008, 81% of the organizations in 2010 and in 2012 it is around 83%. The tools used most commonly for TNA are performance appraisals and employee/supervisor surveys. It also appears almost all learning and development techniques are showing a relative increase in their use when compared with 2010 data. It appears that majority of the respondents are still reliant on external training courses (94%) and in-house training course (83%). There has been a significant increase in the use of job rotations from 46% in 2010 to 72% in 2012 and mentoring/coaching from 27% in 2010 to 56% in 2012. Most organizations are becoming Technology savvy. 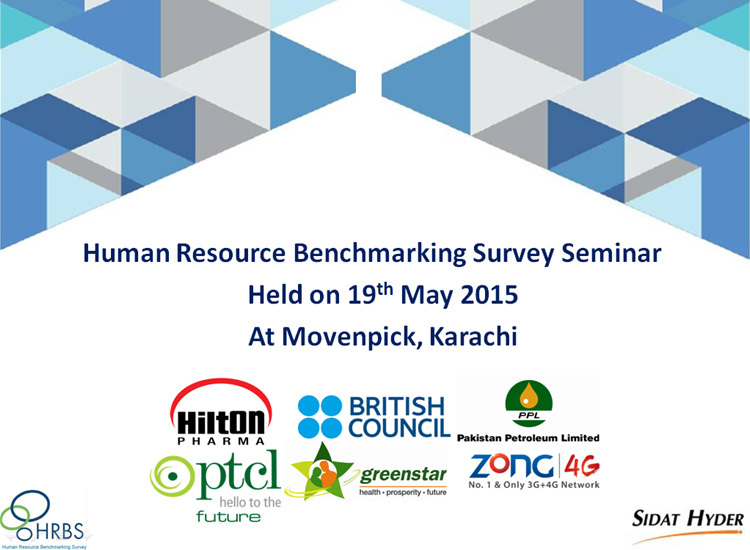 89% respondents use HRIS and 44% use an ERP software. Majority (89%) of organizations from the manufacturing and services sector use an automated process for employee record keeping. Similarly, most manufacturing organizations (78%) employ an automated process for attendance while its slightly lower in the case of services sector (56%). 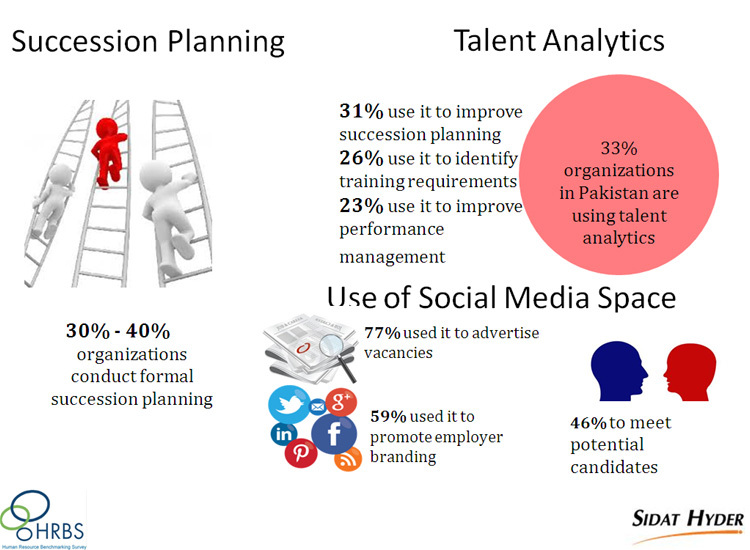 Only 28% use social media for enhancing employee engagement (and most of these belong to the IT/Telco sector). 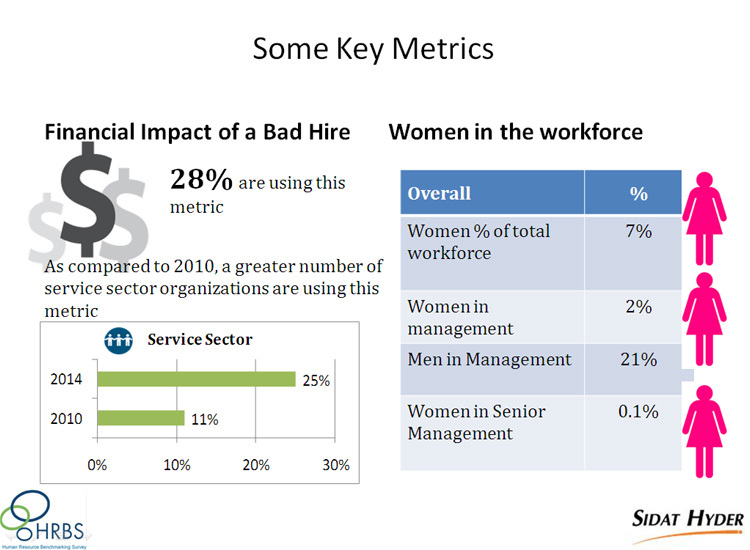 The majority (78%) of organizations in the services sector allow their employees to have a rich profile in social system such as Facebook, LinkedIn, Skype, etc. In 2012, we touched upon the use of metrics/KPIs. 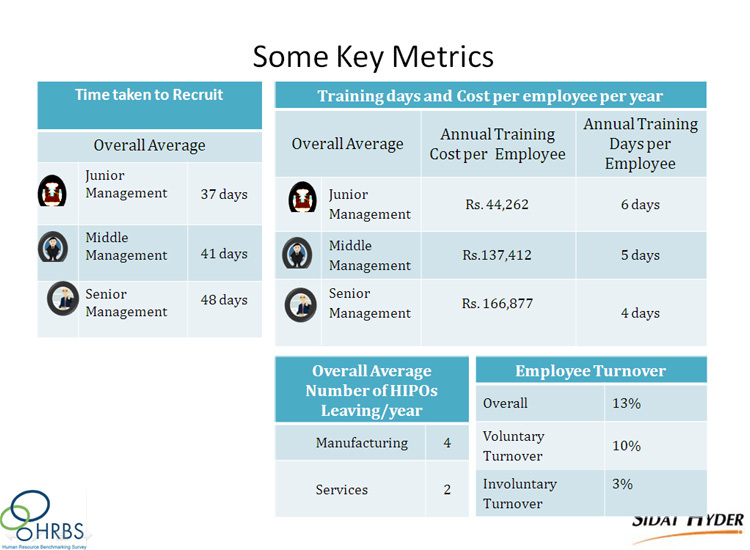 Most metrics are used to measure effectiveness of recruitment and training functions as well as employee engagement and retention. Copyright © 2014 - 2016 Sidat Hyder Worldwide - All Rights Reserved.